HELENSBURGH’S famous Clyde family had two branches — the actors and the shopkeepers. The acting branch included Andy, David and Jean Clyde, three of the six children of touring theatre company boss John Clyde, who was born in Rattray, Blairgowrie, on November 20 1860 and died in Helensburgh on November 1 1920. The reason John brought his family to the burgh was that his brother, Robert McIntosh Clyde, also born in Rattray, came here, set up a grocery business which kept expanding, and decided to stay. The published Helensburgh Directories, while sometimes charmingly inconsistent, are a great source of local information and give details of the Clyde family shops. The 1901-2 directory lists R.M.Clyde, Grocers, at 66 and 92 West Princes Street, with David Clyde living at Hayfield Cottage, 119 West King Street. The 1904 directory has D. and R.Clyde, Grocers, Italian Warehousemen, Provision Merchants and Confectioners, at 64 and 66 West Princes Street, also called Waverley Place. This shop later became Lawson Brothers. In 1905 R.M.Clyde took over the 79 Sinclair Street premises from W. and E.Mowat, opening for business on Friday September 29. He called the shop the King’s Cross Warehouse — apparently because Mitchell’s, the grocers and Italian Warehousemen at the foot of Sinclair Street, called itself the Charing Cross Warehouse after the large railway station. 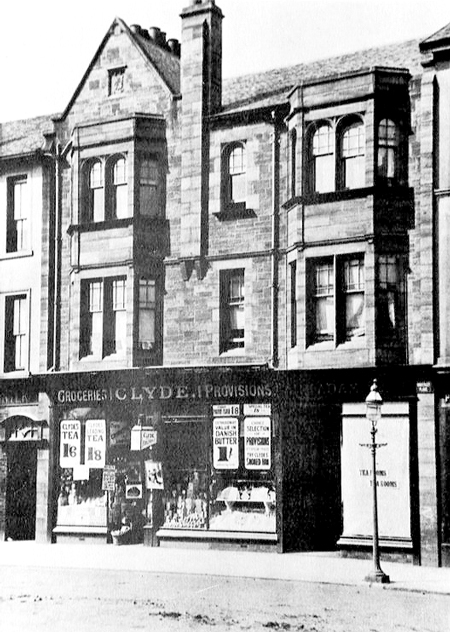 By 1907-8 R.M.Clyde, Grocers, are at 92 West Princes Street and 79 Sinclair Street. But the directory says that David’s Hayfield Cottage is now at 121 West King Street, and also lists R.M.Clyde as living at Ardencaple Farm, Rhu. The directory for 1911-12 has the groceries at 92 West Princes Street and now at 77 and 79 Sinclair Street, with both David and Robert now living at Ardencaple Farm. There is a change in residence in 1915-16, although the shop addresses are unchanged. Robert now lives at 119 West King Street, the name of which has now changed to Bramwell Cottage. This directory also records M.Clyde, Confectioners, at 41 Sinclair Street, with M.Clyde living at Upper Stanwix, Lomond Street. This is probably Mary Clyde, sister of Andy, David and Jean, and she was often assisted by her younger sister Helen, known to all as Nell. The 1919-20 directory only mentions D. & R.Clyde, Grocers and Tea Merchants, at 92-96 West Princes Street, but the 1920-21 directory has much more information. It lists the main grocery at 92-96 West Princes Street, but also D. & R.Clyde, Confectioners, at 38 West Clyde Street, and M.Clyde, Confectioners, still at 41 Sinclair Street. It also states that R.M.Clyde and R.Clyde — presumably his son Bob, born in the burgh on July 24 1894 — live at Bramwell Cottage, 119 West King Street, which relatives still think of as the family home. D.Clyde lives at Lonsdale, 23 West Argyle Street. 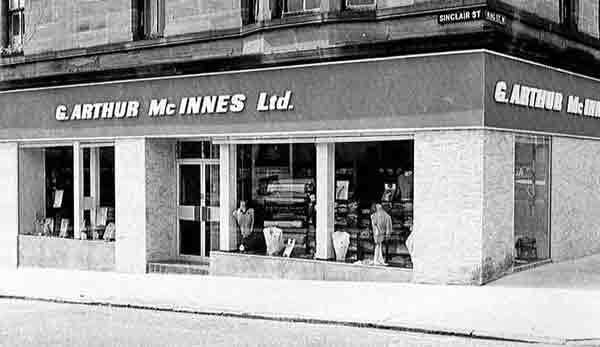 Robert’s daughter Jean married George Arthur McInnes on January 3 1923, and six years later the Sinclair Street shop became G.Arthur McInnes Ltd., Drapers. George died in 1937, but Jean carried on until her death in 1941. Her daughter Isobel — better known as Belle and wife of Waldies garage boss and town councillor George Aitkenhead — ran the business for many years with the aid of manager Duncan Ralph. After she sold the premises it became a toy shop, and now it is a solicitor’s office. Robert, who was co-opted on to the board of Dumbarton Football Club on May 28 1929 and served as a director for several years, died in Rhu on Christmas Day 1947, his brother David having died in Glasgow in 1932. Robert’s son Bob, born in the town on July 24 1894, carried on the grocery business for some years and continued to live at Bramwell Cottage. He was a bachelor for most of his life, but to the surprise of the family he got married at the age of 81 on January 23 1976 to Beverley Annette Richards from Kingston, Jamaica, and they set up home in Drumfork Court. He died on March 24 1979. The main picture shows the Clyde grocery at 64 and 66 West Princes Street in Waverley Place, a red standstone building designed by Robert Wemyss and built in 1897. Next door is the tearoom of McAdam the baker. The other pictures are of the MacInnes store in Sinclair Street.